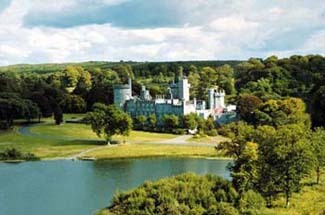 Dromoland had long been the home of the Royal Clan O’Brien. A 36-foot-long genealogy traces the family directly to Brian Boru, high king of Ireland in the 11th century. His firstborn son, Donough O’Brien, inherited the land called Drum-Olain (the Hill of Olan), later changed to Dromoland. Not until 1543, when clan chief Morrough O’Brien pledged his loyalty to King Henry VIII of England, did the O’Briens receive the title of barons of Inchiquin and earls of Thomond. The family’s ancestral home was destroyed during the wars with Cromwell, but Sir Donough O’Brien went on to build Dromoland Castle. Several times during its history, Dromoland had been marked for demolition. The O’Briens were members of the British House of Lords and a target for members of the IRA. Twice, sabotage plans were thwarted by local IRA members who persuaded their leaders that the O’Briens were always fair with their tenant farmers. Despite the standing of the family, their fortunes diminished after the Land Acts of 1880 to 1921 forced them to sell their tenant farms, which had been their major source of income. For another 25 years the O’Briens managed to keep their ancestral home, even attempting to support themselves by running a dairy farm. In 1948 fiances were so low that they accepted tourists as paying guests. Lord Inchiquin finally sold the castle and 400 acres of land, including hunting and fishing rights, to Bernard McDonough, an American industrialist whose grandparents had emigrated from Ireland. Mr. McDonough wanted to use his property to help the economically depressed area and, after considerable expense and effort, opened Dromoland as a luxury hotel. Dromoland is popular among Americans, many who return often to enjoy its beauty and tranquility, and to play golf. A particularly interesting spot on the grounds is a domed gazebo holding a statue of Mercury, the god of speed. In the 18th century, Sir Edward O’Brien buried his favorite racehorse here. He once bet his entire estate, including Dromoland, on his favorite horse, Sean Buidlhe. Fortunately, the horse won and Sir Edward, undoubtedly relieved, later built this monument. From Shannon Airport, follow N18 north toward Ennis. Nearby: horseback riding; deep-sea fishing; Bunratty Castle and Folk Park; Cliffs of Moher. Although substantial changes have been made to the original structure of Dromoland Castle, many touches from the past remain. O’Brien ancestral portraits line the walls of the formal public rooms. Waterford crystal chandeliers, oak paneling, damask wall coverings, Georgian antiques, and thick carpets give an appropriate baronial atmosphere. Comfortable sofas and chairs by the fireplace create a cozy spot to enjoy a cup of tea while relaxing with a good book. Guest rooms in the old wing are the grandest with tall windows and huge four-poster beds. Several have fireplaces. Rooms in the newer wings are standard in design. Some guest rooms are done in floral patterns, others in subdued colors. Eight rooms are built into turrets, and room 206 has an exceptional view of the grounds. With a nod to the 21st century, guest rooms also have flat-screen TVs. Well-prepared traditional cuisine, such as roast lamb and Irish smoked salmon, is served in a dining room looking out onto a lake. Lunch is served in the tower bar that was once Lord Inchiquin’s study.